A funeral pyre and a vibrant Veteran’s #2 rose: what contrarieties does this book of ninety-one pages hold beyond its cover? Wallace confirms in her brief preface that she has discovered such collisions of “music and cacophony,” their “sounds of sorrow and song, grief and joy” wherever she’s traveled. Indeed her poems in four numbered sections hum along from darkness to light, from grief to acceptance, and from weakness to power. “… all our dreams / of open windows / yellow kitchens, / lost, lost.” The poet sings of a shattered relationship, but stops short of a tell-all. Section III detours away from the darkness into places of light and water, the latter always a redemptive and restorative symbol. Settings move from a long pond to a lake, to an island, and then to a small pond; yet some heavy minor chords remain. Together at the end of this section, “Night Ride, Passing the Nickerson Bike Trail,” the witnessing of a car killing a deer, and “Treasure Hunt,” the recollection of a child’s search for an absent father, nearly hurtle the reader back into that other morose place. What prevents that is the poet’s stance, somewhat confident now, confronting grim reality: “The deer is dead, is surely dead….” And if the woman falls short as a “woman-man, half Odysseus, / half Penelope,” the assertion alone is strong. 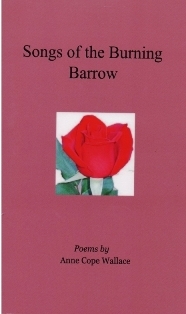 From the publisher : Please allow two-four weeks for delivery when ordering Songs of the Burning Barrow online. Kathleen Thompson is the author of The Nights, The Days, and The Shortest Distance.